Hot on the heels of the map of US state stereotypes I am delighted to present a second one. This time it’s a map of Google searches in the UK for various nations across Europe. It was compiled by taking the most frequent result from Google’s autocomplete function. For instance, type in, “Why is Italy…”, and Google automatically fills in the most popular result with “Why is Italy shaped like a boot”. Highlighting just a few: Switzerland is viewed as rich; Austria is racist; Ireland is green. 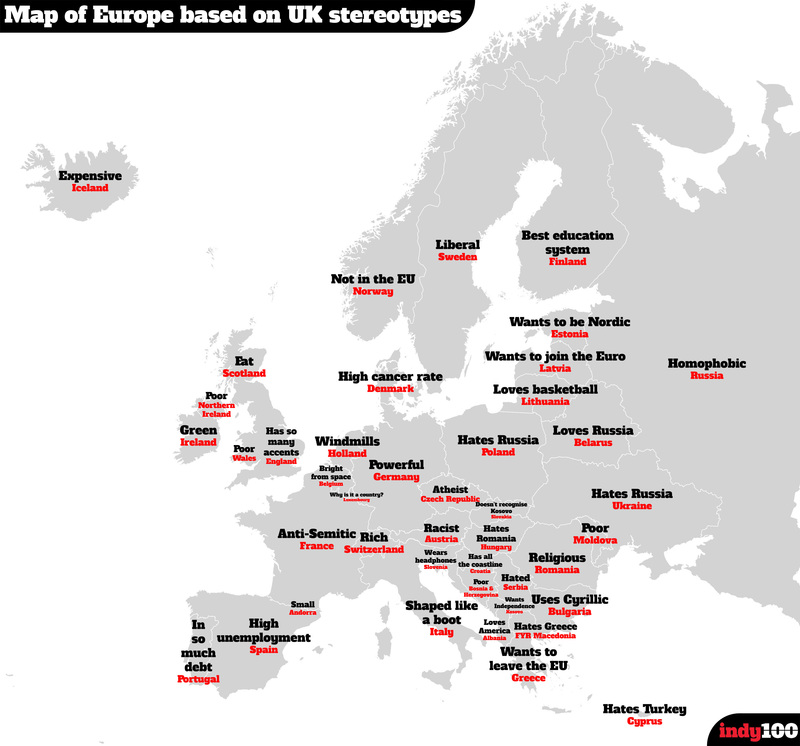 Map: European nation stereotypes by British Google users. Courtesy: Independent Media. Google became a monstrously successful technology company by inventing a solution to index and search content scattered across the Web, and then monetizing the search results through contextual ads. Since its inception the company has relied on increasingly sophisticated algorithms for indexing mountains of information and then serving up increasingly relevant results. These algorithms are based on a secret sauce that ranks the relevance of a webpage by evaluating its content, structure and relationships with other pages. They are defined and continuously improved by technologists and encoded into software by teams of engineers. But as is the case in many areas of human endeavor, the underlying search engine technology and its teams of human designers and caregivers are being replaced by newer, better technology. In this case the better technology is based on artificial intelligence (AI), and it doesn’t rely on humans. It is based on machine or deep learning and neural networks — a combination of hardware and software that increasingly mimics the human brain in its ability to aggregate and filter information, decipher patterns and infer meaning. Yesterday, the 46-year-old Google veteran who oversees its search engine, Amit Singhal, announced his retirement. And in short order, Google revealed that Singhal’s rather enormous shoes would be filled by a man named John Giannandrea. On one level, these are just two guys doing something new with their lives. But you can also view the pair as the ideal metaphor for a momentous shift in the way things work inside Google—and across the tech world as a whole. Giannandrea, you see, oversees Google’s work in artificial intelligence. This includes deep neural networks, networks of hardware and software that approximate the web of neurons in the human brain. By analyzing vast amounts of digital data, these neural nets can learn all sorts of useful tasks, like identifying photos, recognizing commands spoken into a smartphone, and, as it turns out, responding to Internet search queries. In some cases, they can learn a task so well that they outperform humans. They can do it better. They can do it faster. And they can do it at a much larger scale. This approach, called deep learning, is rapidly reinventing so many of the Internet’s most popular services, from Facebook to Twitter to Skype. 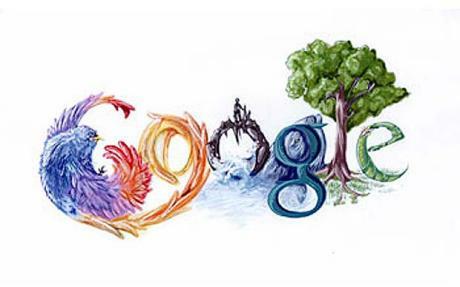 Over the past year, it has also reinvented Google Search, where the company generates most of its revenue. Early in 2015, as Bloomberg recently reported, Google began rolling out a deep learning system called RankBrain that helps generate responses to search queries. As of October, RankBrain played a role in “a very large fraction” of the millions of queries that go through the search engine with each passing second. 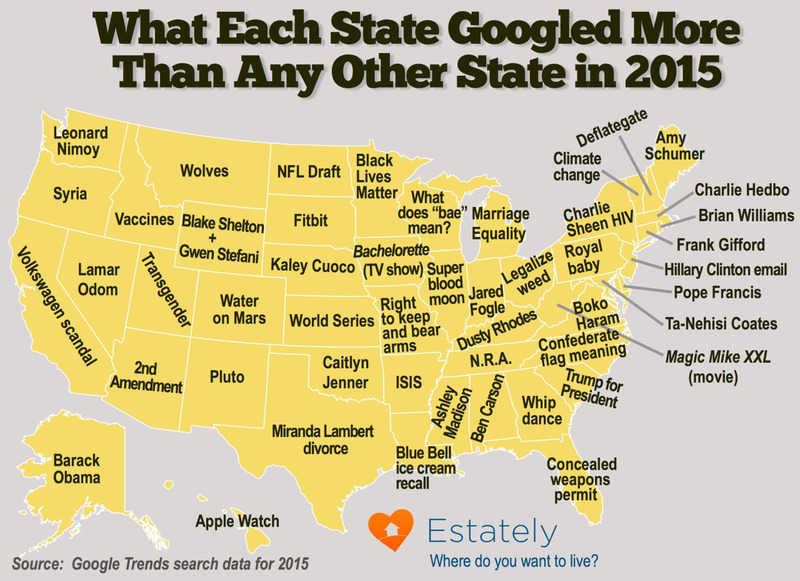 This treasure of a map shows the most popular Google search terms by state in 2015. 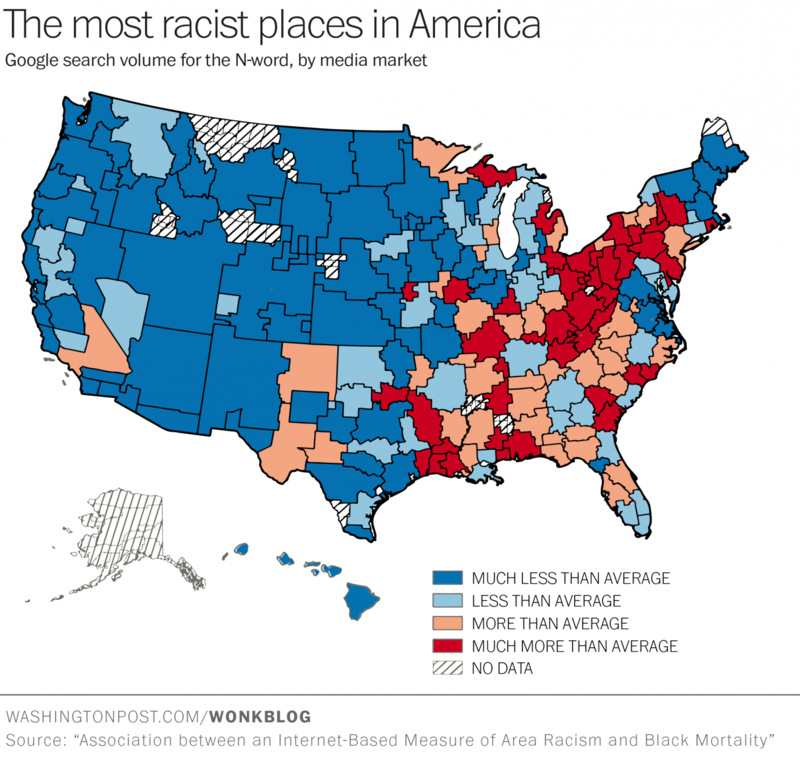 The vastly different searches show how the United States really is a collection of very diverse and loosely federated communities. The US may be a great melting pot, but down at the state level its residents seem to care about very different things. For instance, while Floridians favorite search was “concealed weapons permit“, residents of Mississippi went rather dubiously for “Ashley Madison“, and Oklahoma’s top search was “Caitlyn Jenner“. Kudos to my home state, residents there put aside politics, reality TV, guns and other inanities by searching most for “water on mars“. Similarly, citizens of New Mexico looked far beyond their borders by searching most for “Pluto“. And, I have to scratch my head over why New York State cares more about “Charlie Sheen HIV” and Kentucky prefers “Dusty Rhodes” over Washington State’s search for “Leonard Nimoy”. The map was put together by the kind people at Estately. You can read more fascinating state-by-state search rankings here. It had never occurred to me, but it makes perfect sense: there’s a direct correlation between Muslim hates crimes and Muslim hate searches on Google. For that matter, there is probably a correlation between other types of hate speech and hate crimes — women, gays, lesbians, bosses, blacks, whites, bad drivers, religion X. But it is certainly the case that Muslims and the Islamic religion are taking the current brunt both online and in the real world. Clearly, we have a long way to go in learning that entire populations are not to blame for the criminal acts of a few. However, back to the correlations. Mining of Google search data shows indisputable relationships. As the researchers point out, “When Islamophobic searches are at their highest levels, such as during the controversy over the ‘ground zero mosque’ in 2010 or around the anniversary of 9/11, hate crimes tend to be at their highest levels, too.” Interestingly enough there are currently just over 50 daily searches for “I hate my boss” in the US. In November there were 120 searches per day for “I hate Muslims”. So, here’s an idea. 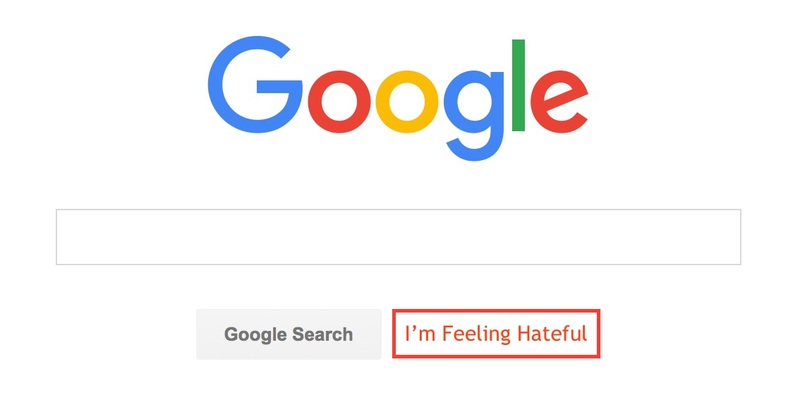 Let’s get Google to replace the “I’m Feeling Lucky” button on the search page (who uses that anyway) with “I’m Feeling Hateful”. This would make the search more productive for those needing to vent their hatred. HOURS after the massacre in San Bernardino, Calif., on Dec. 2, and minutes after the media first reported that at least one of the shooters had a Muslim-sounding name, a disturbing number of Californians had decided what they wanted to do with Muslims: kill them. People often have vicious thoughts. Sometimes they share them on Google. Do these thoughts matter? Yes. Using weekly data from 2004 to 2013, we found a direct correlation between anti-Muslim searches and anti-Muslim hate crimes. We measured Islamophobic sentiment by using common Google searches that imply hateful attitudes toward Muslims. A search for “are all Muslims terrorists?” for example leaves little to the imagination about what the searcher really thinks. Searches for “I hate Muslims” are even clearer. When Islamophobic searches are at their highest levels, such as during the controversy over the “ground zero mosque” in 2010 or around the anniversary of 9/11, hate crimes tend to be at their highest levels, too. In 2014, according to the F.B.I., anti-Muslim hate crimes represented 16.3 percent of the total of 1,092 reported offenses. Anti-Semitism still led the way as a motive for hate crimes, at 58.2 percent. How can these Google searches track Islamophobia so well? Who searches for “I hate Muslims” anyway? 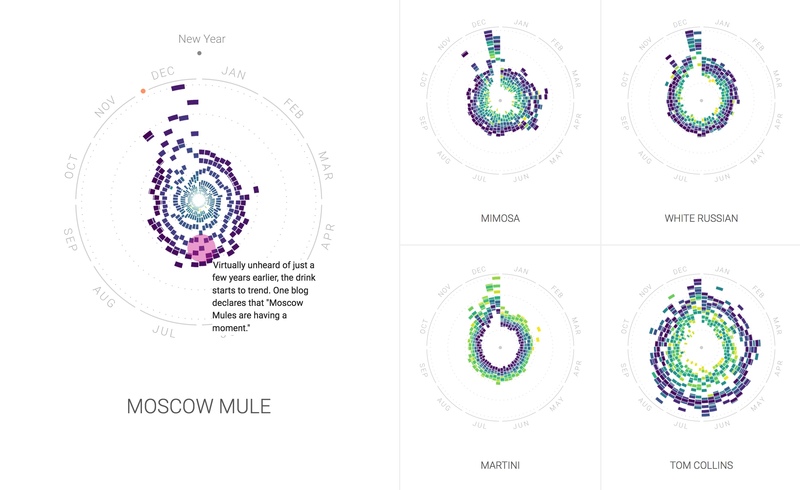 There are about 1,600 searches for “I hate my boss” every month in the United States. In a survey of American workers, half of the respondents said that they had left a job because they hated their boss; there are about 150 million workers in America. In November, there were about 3,600 searches in the United States for “I hate Muslims” and about 2,400 for “kill Muslims.” We suspect these Islamophobic searches represent a similarly tiny fraction of those who had the same thoughts but didn’t drop them into Google. Google searches seem to suffer from selection bias: Instead of asking a random sample of Americans how they feel, you just get information from those who are motivated to search. But this restriction may actually help search data predict hate crimes. Seventy years after the SETI (Search for Extra-Terrestrial Intelligence) experiment began some astronomers are thinking of SETI 2.0 or active SETI. Rather than just passively listening for alien-made signals emanating from the far distant exoplanets these astronomers wish to take the work a bold step further. They’re planning to transmit messages in the hope that someone or something will be listening. And that has opponents of the plan rather worried. If somethings do hear us, will they come looking, and if so, then what? 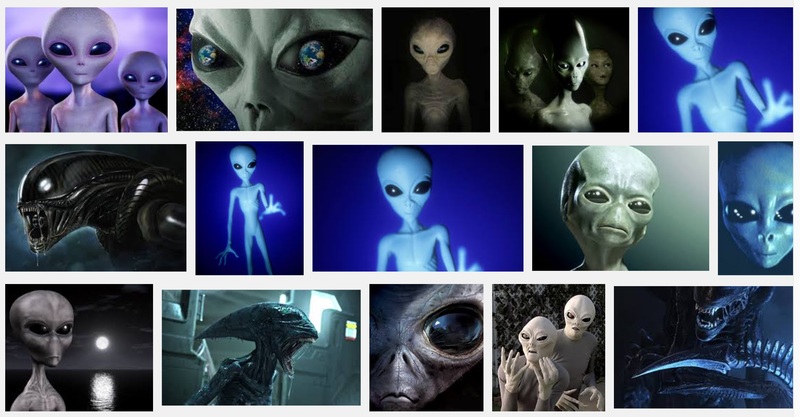 Will the process result in a real-life The Day the Earth Stood Still or Alien? And, more importantly, will they all look astonishingly Hollywood-like? Scientists at a US conference have said it is time to try actively to contact intelligent life on other worlds. Researchers involved in the search for extra-terrestrial life are considering what the message from Earth should be. The call was made by the Search for Extra Terrestrial Intelligence institute at a meeting of the American Association for the Advancement of Science in San Jose. But others argued that making our presence known might be dangerous. Researchers at the Seti institute have been listening for signals from outer space for more than 30 years using radio telescope facilities in the US. So far there has been no sign of ET. The organisation’s director, Dr Seth Shostak, told attendees to the AAAS meeting that it was now time to step up the search. “Some of us at the institute are interested in ‘active Seti’, not just listening but broadcasting something to some nearby stars because maybe there is some chance that if you wake somebody up you’ll get a response,” he told BBC News. The concerns are obvious, but sitting in his office at the institute in Mountain View, California, in the heart of Silicon Valley, he expresses them with characteristic, impish glee. I couldn’t argue with that. But initially, I could scarcely believe I was having this conversation at a serious research institute rather than at a science fiction convention. The sci-fi feel of our talk was underlined by the toy figures of bug-eyed aliens that cheerfully decorate the office. But Dr Shostak is a credible and popular figure and has been invited to present his arguments. Leading astronomers, anthropologists and social scientists will gather at his institute after the AAAS meeting for a symposium to flesh out plans for a proposal for active Seti to put to the public and politicians. High on the agenda is whether such a move would, as he put it so starkly, lead to the “obliteration” of the planet. “I don’t see why the aliens would have any incentive to do that,” Dr Shostak tells me. “Beyond that, we have been telling them willy-nilly that we are here for 70 years now. They are not very interesting messages but the early TV broadcasts, the early radio, the radar from the Second World War – all that has leaked off the Earth. Some cool shortcuts to make the most of Google search. Google’s calculator function is far more powerful than most people realise. As well as doing basic maths (5+6 or 3*2) it can do logarithmic calculations, and it knows constants (like e and pi), as well as functions like Cos and Sin. Google can also translate numbers into binary code – try typing ’12*3 in binary’. By using the ‘site:’ keyword, you can make Google only return results from one site. So for example, you could search for “site:telegraph.co.uk manchester united” and only get stories on Manchester United from the Telegraph website. Currency conversions and unit conversions can be found by using the syntax: <amount> <unit1> in <unit2>. So for example, you could type ‘1 GBP in USD’, ’20 C in F’ or ’15 inches in cm’ and get an instant answer. Search for ‘time in <place>’ and you will get the local time for that place, as well as the time zone it is in. A quick way to translate foreign words is to type ‘translate <word> to <language>’. So for example, ‘translate pomme to english’ returns the result apple, and ‘translate pomme to spanish’ returns the result ‘manzana’. If you type in a flight number, the top result is the details of the flight and its status. So, for example, typing in BA 335 reveals that British Airways flight 335 departs Paris at 15.45 today and arrives at Heathrow Terminal 5 at 15.48 local time. Search for film showings in your area by typing ‘films’ or ‘movies’ followed by your postcode. In the UK, this only narrows it down to your town or city. In the US this is more accurate, as results are displayed according to zip-code. Type the name of a city followed by ‘forecast’, and Google will tell you the weather today, including levels of precipitation, humidity and wind, as well as the forecast for the next week, based on data from The Weather Channel. When you’re enter a search term that has a second meaning, or a close association with something else, it can be difficult to find the results you want. Exclude irrelevant results using the ‘-‘ sign. So for searches for ‘apple’ where the word ‘iPhone’ is not used, enter ‘apple -iPhone’. Read the entire article below here.